I always thought that Innsbruck was good for a one/two-night stop while one holidayed in Austria. But this pretty little town, nestled in the Austrian Alps, offers so much to do that you’ll want to extend your days here if you haven’t already planned for it. The Golden Roof is a landmark in Innsbruck. Before I get started about all that you can do in Innsbruck, let me tell you a bit about it. 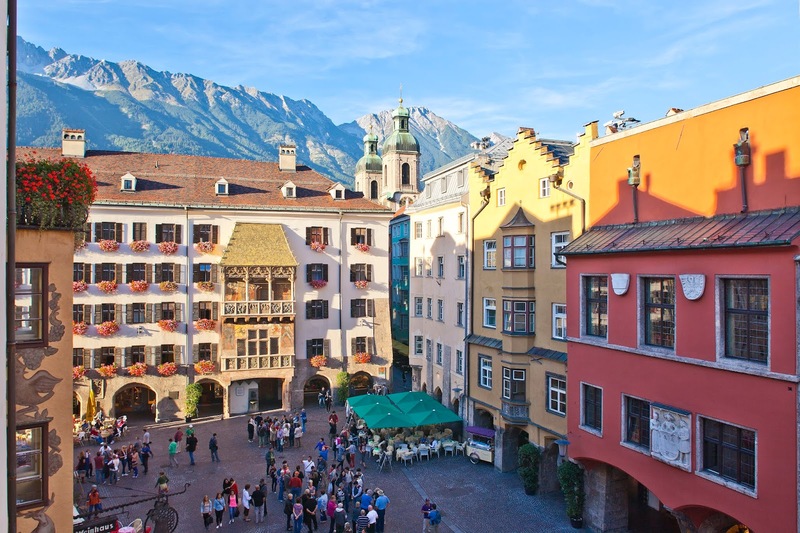 Boasting eight hundred years of urban history and set within a beautiful landscape of lush forests and snow-capped mountains, Innsbruck is the capital of the Tirol region. 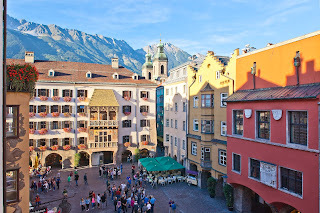 Innsbruck is a place where you can wear high heels as well as hiking boots; enjoy open-air concerts, catch an opera on the mountain slopes or take a quick cable car ride up to a mountain peak and play in pristine snow. I love picturesque European towns that are small enough to be covered by foot. My hotel, GrauerBär, is a stone’s throw away from the old town. As I dump my bags in my hotel room, not wanting to waste any time of my three days here, I head down the street towards the old town. Since Delhi is already scorching, the first thing that strikes me when I step out of the hotel is the cool mountain air. The freshness of the air makes me wonder if simply inhaling this air will cleanse my lungs of the pollution that I am so used to breathing in. The cobbled street is filled with souvenir shops selling alpine wear among other things, some gelato shops, the famous Sacher Café and even a Speckaria. After a two-minute walk I reach the Golden Roof, a famous landmark of Innsbruck. Covered with 2,657 gilted copper tiles it was built in 1420 by Frederick IV as the residence of Tyrolean sovereigns. More than just a historical site, I love the setting of the Golden Roof – while towering snow-covered mountain peaks loom behind it, the bustling Maria Theresien Street invites you ahead with street-side cafes, beer gardens, more shops and even big departmental stores. Culture and Music: Innsbruck offers plenty of historical and cultural tours to choose from. Take your pick from the walking tour of the old town covering the Golden Roof, Helbling House, Imperial Palace and the Court Church among other sites, or one that takes you further to sites including the Ambras Castle set amidst lush gardens and even a Bell Museum. A word about the Bell Museum here – when I saw it on my itinerary I wasn’t particularly excited about it. But after visiting it, I would highly recommend it because one gets to see the entire process from molten ore to a gorgeous bell. One of the oldest and largest bell foundries in Europe, this museum gives a new-found meaning to bells that one sees all over the Continent without giving much thought to how they are made and the science behind creating the perfect ringing sounds. And of course, if you’re musically inclined, there’s loads going on. From the Innsbruck Promenade Concerts to the Ambras Castle Concerts there’s a varied choice of music as well as settings. Kick back to the sound of an authentic Tyrolean Brass Band or to the beat of some jazz, rock or blues. Summer Activities: The easily accessible mountainous terrain and cool weather makes Innsbruck ideal for outdoorsy activities. Certified guides and designated hiking buses ensure a safe and fun hiking experience for various levels. There are easy hikes including specially designed family hikes across meadows and larch forests or more challenging ones featuring long-distance hikes some including a 5,000 km one through the Alpine regions of Austria, Italy, Slovenia, Germany, Swtizerland and France. If you prefer to be on two wheels rather than on your feet, there are 200 km of well-maintained cycle paths. You can even pick from a wide variety of golf packages designed to suit beginners as well as low-scorers. The only thing common in all will be beautiful fairways and greens within Innsbruck or venture out to any of its neighbouring holiday villages. Or, if you don’t want much exercise, but just want to have some fun in the snow, do what I did – take a cable car from the city center to high Alpine Terrain. The Nordkettenbahn took us from 1,837 feet above sea level to Seegrube station at 6,250 feet within 20 minutes. After a leisurely stop for a traditional Austrian meal at Seegrube restaurant and enjoying a folk music and dance performance by a family that performs in the city center every day of the year, we went up further to Hafelekar station at 7,401 feet. Who said that climbing a mountain was hard work? Although we didn’t have the time for it but you can even add a visit to an Alpine Zoo on your way up or down. There are great eating out options in Innsbruck, offering a range of cuisine. But if you’re looking for Indian food there are two very good restaurants. Madhuban offers pan-Indian fare from Punjabi and Kashmiri to Peshawari and Goan. The food here is tasty but more suited to the western palate. Service can be slow, so do keep that in mind if you are in a rush. If you’re looking for something spicier, head to Sahib. Unless you like your tongue on fire, ask them to keep the spice level medium to low. Shop like a Local –While in Europe, I always like to know of a couple of places to buy stuff like cheese, cold cuts and chocolates. My Austrian friends suggested two stores that you will find in various locations, Spar and Billa. These stores are well priced - the chocolates at Billa cost half as much as at the Delhi Duty Free! And if you like to try variety, you can even buy some cans of Austrian and German beers and fruit flavoured Schnapps. But remember to buy these things for local consumption while you are there because restrictions on carrying food and alcohol items into India have become very stringent. Sweet Cravings: Austria is known for its pastries. Innsbruck boasts the Sacher Café. People come here to not only indulge in the famous Sacher torte and coffee but also have it packed to carry back home to their friends and family as a symbol of Austria. And then there’s the strudel. While the cinnamon flavoured apple strudel is the most popular, you will be spoilt for choice of fillings ranging from cheese to different fruits at the Kröll Strudel Cafe. Finally, Tomaselli is the brand of gelato all over Innsbruck. Indulge in decadent flavours ranging from creamy Nutella to fresh and fruity green apple and popular local flavour marzipan-filled Mozart. Crystal World: Swarovski Kristallwelten (Swarovski Crystal Worlds), one of Austria’s most popular attractions. After renovations for the 120th anniversary of Swarovski and its own 20th anniversary in 2015, it is even larger, more sparkling, and more fascinating than ever. 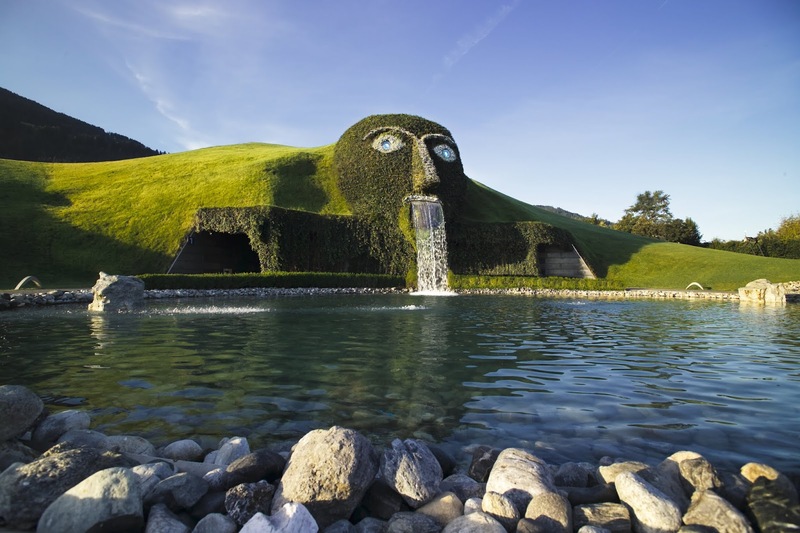 To celebrate its 100th anniversary in 1995, the company had opened Swarovski Crystal Worlds, a theme park featuring a magical menagerie of art installations, where the centerpiece was the Giant. The story of the Giant goes thus: he had set out to experience the world and all of its treasures and wonders, and with this knowledge, the Giant settled down in Wattens, Tyrol, where he has watched over his Chambers of Wonder ever since. As we move from one chamber to another we amazed with the dazzling display of crystals through art and creativity. During the renovation, five Chambers of Wonder have been redesigned and include a romantic winter landscape with 150,000 sparkling Swarovski crystals and crystal sculptures of up to 1.86 meters in height. Music, mirrors and motion have been used effectively to create a wondrous space. The latest additions also include the Crystal Cloud that consists of some 800,000 hand-mounted Swarovski crystals, floating above a black Mirror Pool. Finally, keeping in mind that people invariably visit with families, there is a four level playtower offering a broad variety of play experiences and a spatial environment for young visitors. And of course, at the end of the tower is the largest Swarovski store filled with jewellery, figurines and other bric-a-brac. Innsbruck Card: To make your visit comfortable as well as economical, I would recommend that you buy the Innsbruck card. Costing 33 euros for 24 hours, 41 euros for 48 hours and 47 euros for 72 hours the all-inclusive card gets you cash-free access to all sights and museums, cable cars as well as main means of transport in the Innsbruck region. A version of this article first appeared on IndiaToday.in on June 1, 2017.